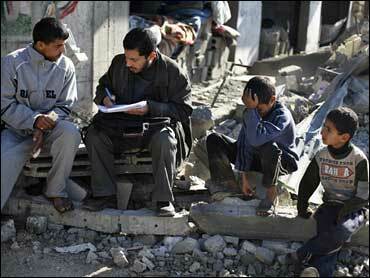 Sitting on rubble, using his briefcase as a writing table, human rights researcher Yasser Abdel Ghafar interviewed residents of a house shelled by Israel, part of his assignment to compile detailed lists of killed and wounded during Israel's 23-day war on Gaza's Hamas rulers. His group, the Palestinian Center for Human Rights (PCHR), released a final tally Wednesday, saying 1,284 Gazans were killed and 4,336 wounded, the majority civilians. Yet Israel, insisting that Hamas is inflating civilian casualties, said it has the names of more than 700 Hamas militants killed in fighting. The wrangling over the final toll, particularly the ratio of combatants and civilians, is part of the rival Israeli and Palestinian narratives of the Gaza war. Israel portrays it as a justified attempt to finally halt years of indiscriminate Hamas rocket attacks on southern Israel. The Palestinians say it was a brutal onslaught in which troops used disproportionate force in one of the world's most densely populated areas. Some bombings and shellings of homes, even if targeting militants, killed entire families. Israeli Defense Minister Ehud Barak said Hamas fighters fired rockets from civilian areas and stored explosives in mosques and schools. Yet he acknowledged that troops "moved forward with fire" to prevent Israeli casualties and that "nobody had any illusions that civilians wouldn't be harmed as well." The growing international outrage over Israel's offensive has been fueled by the scenes of civilian suffering, including bodies of dead women and children in hospital morgues. The PCHR said 894 of the dead were civilians, including 280 children and minors, age 17 and under, as well as 111 women. Of the remaining 390 dead, 167 were members of Hamas' civil police, many of them killed on the job during Israel's surprise attack on dozens of security compounds on the first day of the war. The civilians not only included innocent bystanders, but also Hamas members killed in non-combat situations, such as Said Siam and Nizar Rayan, two top Hamas leaders assassinated, along with their relatives, in massive bombings of homes, said Ibtissam Zakout, head of the PCHR's research team. The rest, or 223, were combatants, she said. That figure is higher than the 158 dead fighters acknowledged by Hamas, Islamic Jihad and other militant groups. "Maybe they (the militants) were interested to show that they have fewer losses and casualties," said Zakout. Others, such as Gaza Health Ministry official Moawiya Hassanain, have raised the possibility that the militant groups buried some of their fighters in secret, without reporting their deaths. CBS News' George Baghdadi reported from Damascus, Syria that senior Hamas leader Khaled Mashaal claimed a "remarkable victory" over Israel Wednesday, saying the Jewish state's mighty military wasn't able to achieve its goals in the Gaza Strip. "Hamas, which they wanted to finish, has become more powerful and more popular as it entered every house and became a slogan in Palestine and the rest of Arab nation," Mashaal said in a televised speech. Zakout said the PCHR count, including the distinction between militants and civilians, is based on cross-checking hospital records and interviews with survivors. The group is affiliated with Geneva-based International Commission of Jurists and has won two European human rights awards. During the war, 13 Israelis were killed, including three civilians struck by rockets. The other 10 were soldiers. Israel has not provided its own version of a Palestinian death toll, though Barak said he believes dead militants outnumber dead civilians. "Many more than 700 Hamas men were killed, many more," he told Israel's Channel 10 TV. "We know their names," while noting that civilians were hit as well. A veteran is Hassanain (seen at left), the Health Ministry official who has been recording dead and wounded since the start of the second Palestinian uprising in 2000. Hassanain's center of operations is a tiny room with furniture he said dates back to pre-1967 Egyptian rule of Gaza. Equipped with just a beeper, a fax, a landline, two mobile phones and a walkie talkie, Hassanain dispatches dozens of ambulances and records the medics' first reports of dead and wounded on loose sheets of paper. In between, he accompanies ambulances taking the most seriously wounded to Israel and Egypt. Hassanain's handwritten lists, including some stuffed in his jacket pocket, are eventually fed into a clunky old computer by an assistant and transferred to the information center of the Health Ministry. The Health Ministry's final toll for 23 days of fighting is 1,324 dead and about 5,400 injured - or 40 more dead and about 1,000 more injured than the PCHR. Radi said names are added to the death toll only after careful consideration, including identification by ID by relatives, particularly if bodies arrive in a dismembered state. The physician claimed that only about 100 of the dead were combatants, saying he is relying on reports by the militant groups themselves. Zakout, asked about the discrepancies in casualty tolls, said she believes there has been some inadvertent double counting at the ministry, an outcome of the chaos of the war. Also, the ministry counts psychological trauma cases as war injuries, while PCHR does not, explaining the significant gap in the number of wounded. The PCHR has been publishing daily updates of the names of the dead on its Web site since the beginning of the war, and expects to present the final list in several days. Field worker Abdel Ghafar said the hard work is just beginning. In his district, the southern city of Khan Younis, he said he has counted 83 deaths. Initial questioning determined that 61 were civilians, 13 policemen and nine gunmen, he said. Of the militants, five were from Hamas and four from Islamic Jihad. Since a cease-fire took hold Monday, he has started making the rounds to take affidavits from survivors about the details of attacks. On Wednesday, he visited the Najar family, whose three-story house close to Israel's border was destroyed by shelling on Jan. 13. Two people, patriarch Khalil Najar, 75, and one of his granddaughters were killed in the attack, according to Abdel Ghafar's initial reports. Relatives and neighbors sat on plastic chairs in an alley near the ruins. Abdel Ghafar approached the group and asked for a witness. Najar's nephew, Rami, 28, said he was in the house at the time of the shelling, pointing to an injured right leg. He hobbled with Abdel Ghafar to the ruins, and the pair sat down on a large chunk of concrete. Using his briefcase as a writing table, the researcher took down the survivor's story.